AirStarPD is an aftermarket local controller designed to control one Rotary Screw or Reciprocating compressor for energy efficiency and machine safety. Built on the Allen Bradley MicroLogix 1100 PLC platform to Nema and NEC standards, all components are housed in a Nema 12 or optional Nema 4X enclosure and offer six standard analog inputs (expandable to eighteen), ten digital inputs and six digital outputs. The processor has a native Ethernet port that connects to the Color HMI with an optional 5 port Ethernet switch to any other Ethernet compatible device. Modbus communications are also available optionally. The HMI will serve as the operator interface for all machine control functions, set-point entry and modification, variable monitoring and event history. The data table is configured to 3PX standards for easy access from the 3PX-Backbone data concentrator for master control (sequencing) solutions and SCADA for remote monitoring. Elaborate HMI functionality allows complete configuration, tuning, troubleshooting and operation of the compressor. Familiar Allen-Bradley modular PLC platform that can be easily supported. No proprietary parts are used. Support whether on-site, by phone or modem connection is prompt, effective and available around the clock. Documentation thoroughly addresses set-up, tuning, troubleshooting and operations. Ethernet communications are native and Modbus is optional for connection to any third party DCS, MIS or SCADA systems. Plug and Play kits available for fast installation in your existing enclosure. 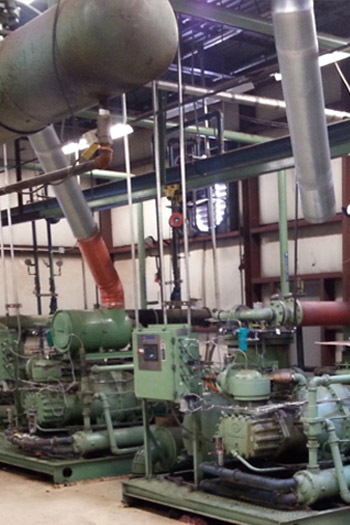 Variable Speed Drive control is optional for Rotary Screw Compressors. Compatible with 3PX-Backbone which permits electronic integration with numerous third party controllers. As part of our AirStar family of controllers, Case has a unique control scheme for SullAir two-stage, rotary screw compressors. This solution turns the problematic spiral valve into an asset, making this a very responsive machine by taking direct control of the inlet and spiral valves from the PLC. Increased accuracy following demand changes – PID loop controlled, allowing tuning to plant specific demand. Increased efficiency by fully utilizing the spiral valve thereby minimizing the use of the inlet valve throttle. Further improved efficiency with coordination of multiple compressors with Case’s AirMaster™. Uses an Allen Bradley PLC for improved reliability, flexibility and supportability. If you’re interested in Centrifugal or Rotary Compressor Automation please complete this spreadsheet, or contact us today.